Occasionally I receive complaints that my German cake and cookie recipes don't work. I always thought the problem is converting grams to cups. However, wrong conversion is not the only reason when the result of a recipe is disappointing. I did some research and learned that the flour types and classifications vary between Germany and other countries. Using a different flour than described in a recipe can cause the same problems as wrong measurement for the flour. 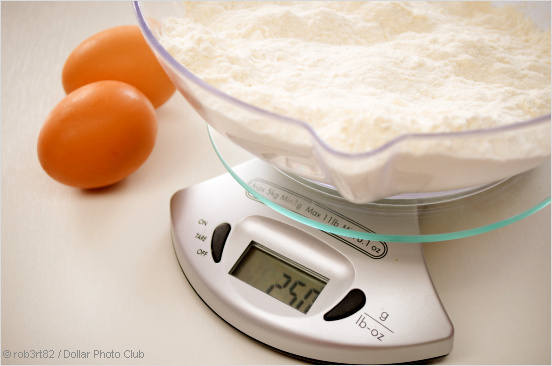 How much weighs a cup of flour? One cup of all-purpose flour has not the same equivalent in gram as one cup of cake flour. An important fact I didn't know so far. Reading about different flour types, cup measurement, and the mistakes one can make, really made my head spin. The easiest solution would be to use a kitchen scale. But if you want to stay with cups, here are my findings that, hopefully, help you to make my German cookie & cake recipes a success. When I talk about flour for cookies & cakes, I am talking about wheat flour. The ash content tells us how much of the whole grain remains. Although the amount of gluten is important for the baking quality of flours, you hardly ever find information about that on a flour package in Germany. Type 405 generally has a protein content of 7% to 9%. In the US flour types are defined by their protein (gluten) content. Click here to see a chart of flour types from various countries. The higher the protein content, the stronger the flour is. This was the most important discovery for me. So far, I used the term "plain flour" and the German type 405 in my recipes, which was not very clear for users outside of Germany. So I edited all recipes, referring to this help page, and using the term pastry flour. Pastry flour is equivalent to the German flour type 405, it has the same protein content. It is fine-textured, white and soft. I use it for nearly all my recipes. All-Purpose flour can be used for most cakes and cookies as well. However, you need to adapt the amount as it has slightly more protein and takes more liquids. 1 cup weighs slightly more than a cup of pastry flour. Protein / gluten is responsible for the structure of baked goods. Too much flour, or one with higher gluten, result in dry or tough cakes and cookies. Bleaching and treating flour with chemical preservatives is not allowed in Germany. The most common flour treatment is with ascorbic acid, it prevents that flour goes rancid, and it makes the gluten structure stronger. Why do I recommend to use a kitchen scale? If you really want to be on the safe side with my recipes, you might consider to get a digital kitchen scale. When you weigh the ingrediences for a recipe, you leave out any guesswork. Scales come in various styles, weighing capacities and prices. I am pretty sure you are getting used to using a scale quickly. Disclosure: The links below are Amazon.com affiliate links. When you buy a product through these links I earn a small commission (there is no extra cost for you). This money helps me to maintain this website and provide the free information for you. Thank you in advance for your support. Click on an image and check out these and other kitchen scales at Amazon.com. Is there a correct way of measuring flour? Honestly, I don't know. I read many articles and tips on the internet which made my head dizzy. Trying to convert my German recipes to US measurement standards is still most confusing for me. Don't laugh at me... 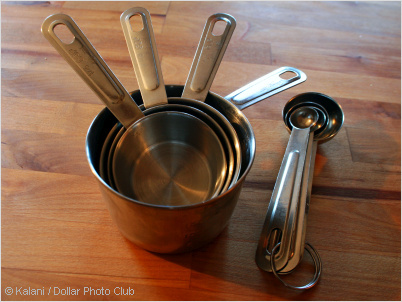 When I heard about "measuring with cups" for the first time, I thought of normal coffee or tea cups. It was beyond me how that could ever work, thinking of the different sizes of coffee cups. Then it dawned to me that there must be special measuring cups. To make things even more complicated is the fact that you find conversion charts with different results. 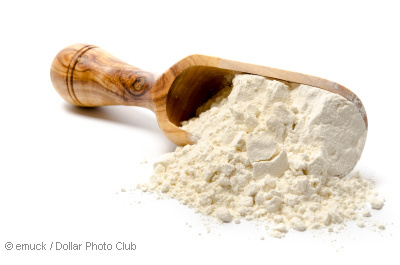 The weight for one cup of flour varies from 110g to 130g, or even more. It obviously depends on the flour brand and how you fill the cup. When a recipe calls for 4 cups, the wrong amount of flour can easily quadruple. Here are a few tips to measure flour and get better results with my recipes. Don't dip the measuring cup into the flour bag. This way you compact the flour and get too much into the cup. Scoop the flour loosely into the cup and level off the top with a knife. Always sift the flour after measuring. Take notes when you need to adjust the recipe, for example if you add more flour, or more liquids/fat. This way you get constant results when you bake the same cake/cookies again. Having said all of the above, I asked my friend Lorelie (she is a fantastic baker!) if my tips make sense to her. She said yes, but she uses the dip method for measuring all ingredients, just what I did not recommend. The most important fact is obviously, that you stay with the same method for all ingredients, so you have the same ratio. That's all about my findings so far. I will add any tips I come across here on this page. So check back again frequently. Below are a couple of recipes you might enjoy.